Take a trip back to 1992 as Jason & Gabe take a look at the fascinating world of Star Wars QVC specials! 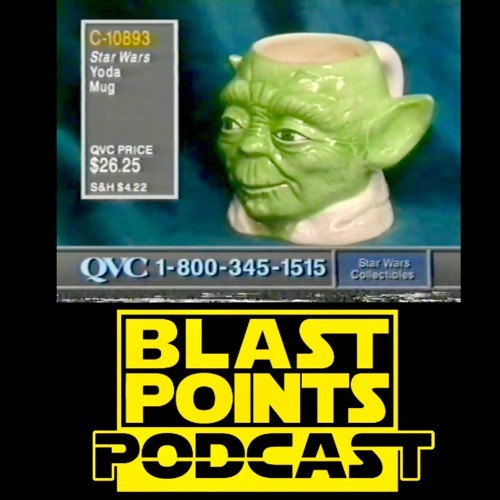 In the early 1990s when Star Wars stuff was as rare as a carded Yak Face, the closest you could get to a Celebration like fan experience was sometimes tuning into Star Wars night on the home shopping channel QVC! There host and super fan Steve Bryant would interview guests like Steve Sansweet and in the episode we look at, Mark Hamill. In between selling Star Wars 15th anniversary sweatshirts and Star Wars film reel suspenders, Mark talks about the prequels, calls from Star Wars fans and he gets a call from a guy named Chip he went to high school with AND says if he's be ever interested in being in a NEW Star Wars movie!!! PLUS before all that we talk about Battlefront 2 and those interesting Han Solo movie crew/crue shirts!!! So get out your phone, stay on the line and celebrate the love with Blast Points!! watch the full Mark Hamill on QVC episode here : https://youtu.be/6D6BY_idXao https://stevebryantblog.com/ Blast Points t-shirts are now available! Get them here: www.etsy.com/shop/Gibnerd?section_id=21195481 visit the Blast Points website! www.blastpointspodcast.com reviews! comics! recipes, articles and tons more! if you dug the show please leave BLAST POINTS a review on iTunes and share the show with friends! If you leave an iTunes review, i will read it on a future episode! honestly! talk to Blast Points on twitter at @blast_points leave feedback, comments or ideas for shows! also like Blast Points on Facebook for news on upcoming shows and links to some of the stuff we talk about in the show!! we are also on Instagram! Wow! your hosts are Jason Gibner & Gabe Bott! contact Jason at Gibnerd@hotmail.com May the Force be with you, always. Download Episode 78 - Star Wars on QVC! Superfan Steve Bryant, Mark Hamill, Sweatshirts, Suspenders & more! Users who like Episode 78 - Star Wars on QVC! Superfan Steve Bryant, Mark Hamill, Sweatshirts, Suspenders & more! Users who reposted Episode 78 - Star Wars on QVC! Superfan Steve Bryant, Mark Hamill, Sweatshirts, Suspenders & more! Playlists containing Episode 78 - Star Wars on QVC! Superfan Steve Bryant, Mark Hamill, Sweatshirts, Suspenders & more! More tracks like Episode 78 - Star Wars on QVC! Superfan Steve Bryant, Mark Hamill, Sweatshirts, Suspenders & more!